Dating back almost 400 years, the oldest public collection library in the United Kingdom was once the study hall of Karl Marx. Manchester’s Chetham’s Library was first established in 1653 and has been serving knowledge hungry scholars ever since, including playing host to Karl Marx while he developed his economic philosophies with Friedrich Engels. The remnants of a depressing public toilet are now a hub of ever evolving street art. Have a seat with the father of modern computing at this Manchester monument. A 19th-century time capsule of travel, fiction, and historic texts still available to the public. Located in a former hospital space that is now a music school of the same name, Chetham’s Library holds over 100,000 texts accumulated across its centuries in operation. The collection was established at the behest of a textile merchant named Humphrey Chetham who expressly stipulated that the library “require nothing of any man that cometh” and be “for the use of schollars and others well affected.” Simply stated, he wanted his posthumous library to be public and academic. The merchant them named dozens of ruling agents who he tasked with collecting a collection of texts and writings to rival any of England’s libraries, and the Chetham’s catalogue began. The library has continually been in use since its inception with scholars and researchers from a number disciplines searching the stacks for info. Among the most famous visitors to the library are Karl Marx and Friedrich Engels who are said to have sat in the medieval surroundings and brainstormed their pioneering economics theories. The books they used to study out of are now set aside on display. At present, over 60,000 of the library’s titles date back to the early 1800’s, represented by crumbling and beautiful leather-bound folios. A number of the books are chained to the bookcases, or as the style of manuscript defense changed, gated in, but most can still be seen by visitors. The building the library is housed in actually dates bay to the 1400’s when it was used as a priest’s college, giving the whole library a lushly historic feel. Chetham's is located opposite the National Football Museum (the Urbis building). Entry to the Library is through the main gate on Long Millgate, just off Cathedral Gardens. Fulham F.C. imploded once everyone excised its giant, hated tribute to the King of Pop. The fake World Cup prize was secretly created after the first one was stolen in 1966. Hidden on the urban banks of a Manchester river are a series of abandoned waterside industrial sites. A gorgeous medieval library where the books are kept in chains. 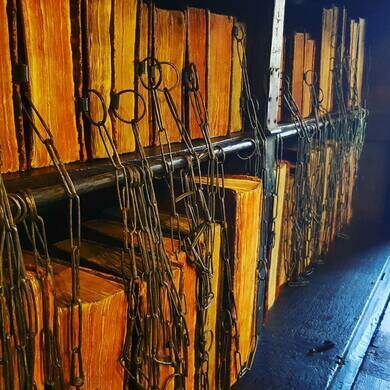 Unchanged for centuries, this medieval library keeps its books in chains. The second largest surviving chained library is housed in this 12th century church. 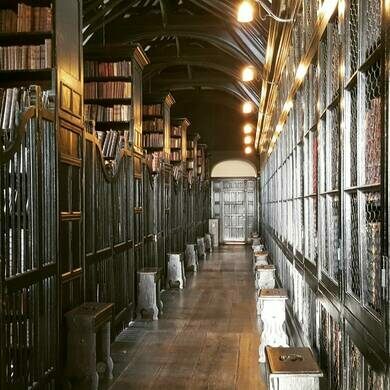 One of the oldest libraries in England, and one of the last of the great medieval chained collections.